New for 2016. 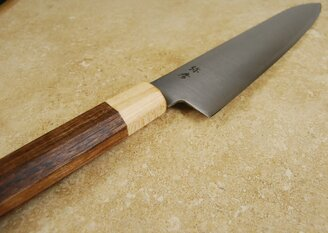 You've just stumbled upon what will certainly be our best selling wa gyuto on the site. 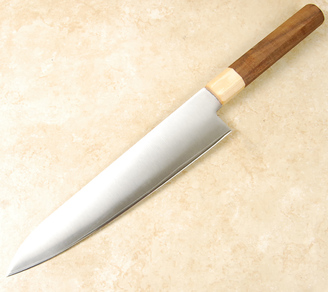 The Yahiko 240mm wa gyuto is made with good quality VG-10 stainless steel that is heat treated to 60 Rockwell. It sharpens very well and holds its edge. It also comes with a semi custom, stabilized walnut, octagonal handle that is beautiful and functional and is made to last. Yahiko is the name of a mountain in western Japan where this blade is made exclusively for CKTG. OOTB the blade could use a tad of sharpening. However, I'm pleased with it ability. It is larger than I anticipated, but I am working on getting better with this blade. Haven't used in a work setting, but at home it works great.. This is an outstanding value "beater", except it is much more refined than that. First off geometry on the knife is excellent, weight is solid without being heavy, handle was fitted perfectly and finished to a high standard. The vg10 used for the knife is good quality and took to the stones well, resulting in an excellent everyday line/general use knife. Absolutely awesome value. Great knife for the price! Stays sharp. Comfortable handle. It's my everyday knife now. I've spent way more on similar blades and I couldn't be happier. I bought this knife for one of my Chefs and now I want to keep it! Holy Cow-for the price this gyuto is amazing!! The finish is really well done-polished and feels good! This is not a lightweight-it is not heavy but feels VERY substantial in the hand as a workhorse knife-not a laser feel at all. Feels GREAT and for the price-you are getting probably one of the best deals from CKTG. I love it but have to give it to one of my Chefs-Bummer as a gift-Bummer! I'm buying one for me ME as soon as i finish this review, Thanks for offering this one-it's a real bargain and also a really great knife. Very sharp, very light. This knife is certainly worth the price. I wasn't sure I'd like a Wa handle for everyday use, but I quickly got used to it and now love it.The knife and walnut handle are beautiful and this tool is amazing in the kitchen.If you're looking at it, go for it, you won't be disappointed. It's lighter than other 240mm gyutos I own (I have a lot) but it arrived in 2 days (thank you CKTG!) and was fantastic right out of the box. I've been able to get an even better edge on it with my stones, and it holds that edge very well- 3 weeks of professional use and I've only needed to hone it with a ceramic steel. Trimming PSMOs for tenderloin, dicing gallons of carrots, onions, celery for stock, cutting flatbreads- it's completely reliable. Originally planned to be my "beater" due to the inexpensive price, this instead is my "Go to" knife. This knife retains it's edge pretty well over the course of pre-service, The metal is soft enough that sharpening it on a wet stone is quick and effective.The price that I paid when it was on sale (99.00) makes this knife a good deal.The only thing that threw me off was the handle and how "large" it is compared to a typical stainless steel knife. But this quickly faded as I got used to and come to love how the handle feels. I now prefer using wooden handles over other types since it is easier on my grip. These were Christmas presents for family and friends. Best received gifts ever!! 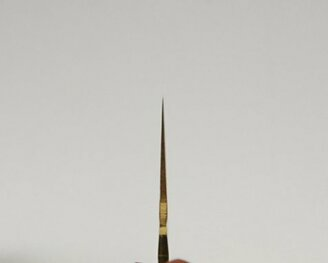 Great sharpness, good for all of my various prep work. Very comfortable handle. Good weight. Very good knife for the price paid . So far the best knife Iv bought . Good weight distribution. Got it delivered to nz . Took 3 days to get here . That's faster than buying things online here within the country . ? ?Excellent service . If your looking to step it up in the kitchen this knife is a great way to do it. VG10 Stainless Steel and easy to maintain a sharp edge. Cutting is 10x easier then it was for me, Thanks! I bought this knife because of the special price. But once I got it i realized it is probably one of the best additions to my collection of other Japanese knives. This has now become my to go knife and otb edge was impecable. The weight and handle are precise and the overall look of the knife is incredible. I have gotten many compliments and I am extremely happy with this knife. Thank you Mark for such a great deal! I got this knife as a gift for my dad. He's never really had a quality knife before, so I thought it would be a good gift. He absolute loves it and wants to show it the respect it deserves.Out of the box, it's not the sharpest thing ever, but it's definitely better than most anything you'd buy at the store. After a little love on my whetstone it was just fine. The length is somewhat intimidating if you're more used to shorter knives. Measure out 240mm to get an idea of how long this blade is before you buy -- just so you know what you're getting.For the price, this is a great knife and you can't go wrong. I'm excited to see what years of use will do to it. This was a gift for a friend so I only lightly handled/used it. I'm impressed at what I bought for the money, nice balance, surprisingly well made handle, excellent rock cutting profile. If I didn't already have a knife that isn't babied I'd get one for myself. Excellent knife. Sharp out of the box. You guys did a great job matching the blade and handle. Its my to go knife for prep and production. I'm so happy with my new knife. It cuts really well and I love the way it looks. Best knife I've used. Thanks! Just got my knife and it's excellent! Has an excellent edge OOTB and has a really nice handle. Can't wait to take this to work tomorrow. Fast shipping too!